Tater tots are delicious little cylinders of love. But with more crunch. Most of their love flavor, however, comes from oil. There is so much oil and grease shoved into store-bought tots that they grease the baking pan all by themselves. Sometimes I make homemade versions of convenience foods such as these. It's oh so much more healthier, and the joy I get from seeing my family eat nutritiously is reward enough. Nah, the real reason for today's post is that: 1) I had a few leftover sweet potatoes (there was this sale at the Try-n-Save), 2) Food52 is running yet another contest, and 3) I overstocked up on Rice Krispies to use up all the leftover Passover marshmallows (had a coupon). Maybe it's because I couldn't have bread for the eight. whole. days. of Passover, but I've been baking up a storm this past week. I made challah, French bread rolls, pizza and Focaccia. Focaccia is an Italian-style flat yeast bread that resembles thick-crust pizza, but with lots of air bubbles on the inside and indentations poked into the outside. 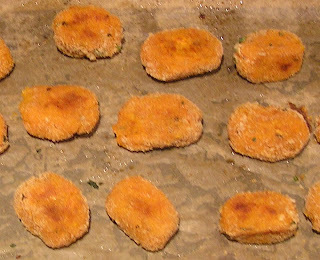 It is brushed with olive oil and herbs before baking and before serving. Sometimes Parmesan or another hard cheese is grated on. 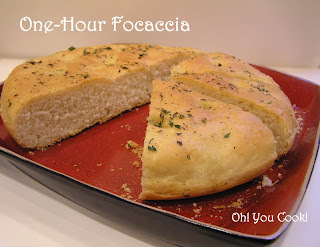 There are sweet variations of focaccia, but I lean towards savory. I have been experimenting with focaccia on and off for months now, but just like my pizza crust, my focaccia-making has been spectacularly unspectacular.